The future of transportation will be autonomous buses that travel using the most efficient routes and schedules, as calculated and determined by the passengers’ destinations, not a government agency. So why would we spend $75 million on a facility that will be obsolete shortly after it is built? At its June 22 meeting, SANDAG will be considering a proposal to build a $75 million facility on some of the most desirable land in all of downtown San Diego for the purpose of parking several empty MTS buses. Bus schedules include built-in downtime at the end of each route to allow drivers time to take their breaks and give them a chance to get back on schedule if they are running late or early from their previous route. Many routes terminate in downtown San Diego, within a few blocks of one another. This leads to clusters of several empty buses parked on the streets while drivers wait for their next route to begin. The idea for a temporary bus parking lot, also known as a layover station, started back in 2012. As the resident populations of Little Italy and downtown San Diego grew, MTS began to receive complaints about its buses using on-street parking, the noise from their idling engines while parked and the unsightliness of the portable restrooms on sidewalks, which were placed there for bus drivers to use while on break. To their credit, MTS officials have a sincere desire to be a good neighbor and minimize the impact of their operations whenever possible. In this effort, MTS and SANDAG developed a plan to acquire the property bounded by A Street, Union Street, B Street and State Street and build a parking lot that would provide parking for up to 18 buses, as well as a breakroom for their drivers. The estimated cost of this proposed project started out at $15 million in 2012 but has increased to $75 million today. How many new bus routes will be created with this new parking lot? Zero. How many more buses will be added to existing routes? Zero. How many more riders will be served by the proposed facility? Zero. In addition to creating zero value for existing transit users, this project also ignores trends in transportation. The future of transportation is not fixed routes with a fixed termination point, nor does it include drivers. The future of transportation will be autonomous buses that travel using the most efficient routes and schedules, as calculated and determined by the passengers’ destinations, not a government agency. So why would we spend $75 million on a facility that will be obsolete shortly after it is built? 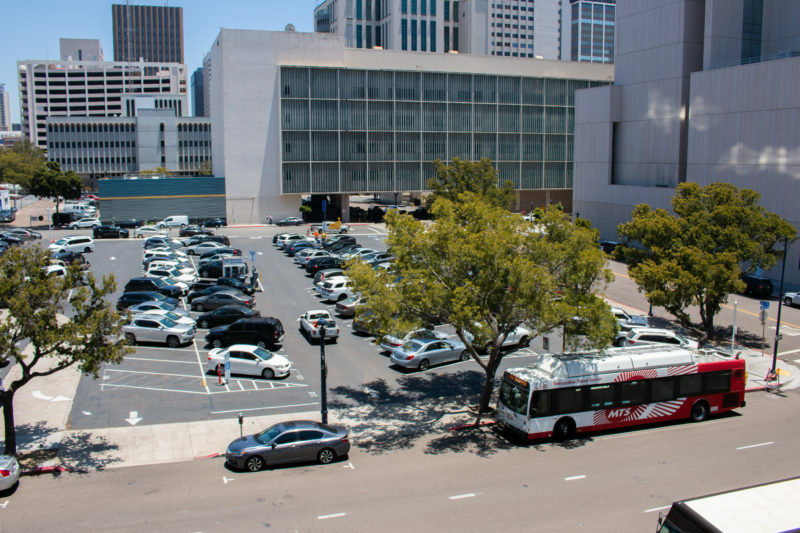 Furthermore, the subject property currently provides over 200 off-street parking spaces and is one of the busiest parking lots in downtown San Diego. Eliminating those parking spaces to make room for 18 buses will exacerbate the existing parking situation, not improve it. Residents in Little Italy and downtown San Diego are understandably frustrated with the current situation, but there is a better, more cost-effective solution that can provide immediate relief while advances in technology permanently solve the issue in the future. Instead of letting the buses idle when they are parked, MTS should better enforce its existing policy of turning buses off while not in service. Instead of placing portable restrooms on sidewalks, MTS should negotiate an agreement for the use of restrooms for their bus drivers with nearby property owners. In order to ensure the buses have a consistent place to park, MTS should exercise its authority to red-stripe curbs to create dedicated bus parking until autonomous buses come online. This alternative could be executed within months, not years as currently proposed, provides immediate relief for the Little Italy and downtown San Diego neighborhoods and saves taxpayers $75 million. Policymakers should apply the basic standard of evaluating project options based on the return on investment. In other words, policymakers should select the project option that accomplishes the greatest public benefit with the least amount of taxpayer dollars. Does the investment of this much taxpayer money still make sense, given more cost-effective alternatives exist and that the transportation industry is on the precipice of major change? San Diego should be preparing for the future of transportation, not investing in the past.